Following on from my post on consumer power I was pondering on the effectiveness of other forms of protest. 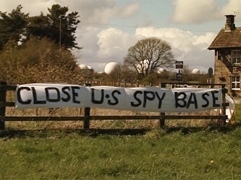 Many years ago we would go to Menwith Hill, the US monitoring station north of Leeds, to take part in peaceful protest against it’s part in the “global war machine”, it being a symbol of our fear of other nations. This last week has seen the Occupy movement setting up a protest outside the camp – the protest continues many years on and I’m not sure of what we have achieved. When I first went to the protests I went with a fear of nuclear annihilation, the Cold War was in full play and Raymond Brigg’s “When the Wind Blows” portrayed a scary potential future. Today, despite the end of the Cold War, the collapse of Communism and improved relationships we still face the potential destruction of our societies though this time it’s not nuclear weapons I’m thinking about. Menwith Hill monitoring station is looking in the wrong place, it’s the environment we should be looking at. The billions of pounds spent on weapon systems to protect us from something that might never happen should be put towards what is really threatening the world today – climate change, poverty and inequality. If we put that money, resources and effort into fighting these threats then the risk of future wars between the haves and have nots would be significantly reduced. Isn’t that the type of security worth paying for? This entry was posted in Economics, Environment, society. Bookmark the permalink.